Dutch ladies wore some type of head covering as part of the traditional clothing. It was made from either lace or stiff fabric, either as a small cap, larger peaked hat, or longer piece reaching to their shoulders. Men also often wear hats, usually a wide-brimmed variety, or flat cap. Most women’s clothing was made of at least two layers, either a dark undergarment with a decorated vest, or a white undershirt with a dark vest. The first layer is often a loose-fitting shirt with either elbow-length sleeves or full-length sleeves. The outer layer is either a close-fitting vest, often embroidered or printed with coloured patterns, or a tunic that would reach down to cover the skirt. Men wear loose-fitting shirts, usually white or navy blues, fastened in the front with a double row of brass buttons. On top they don a vest or suspenders. 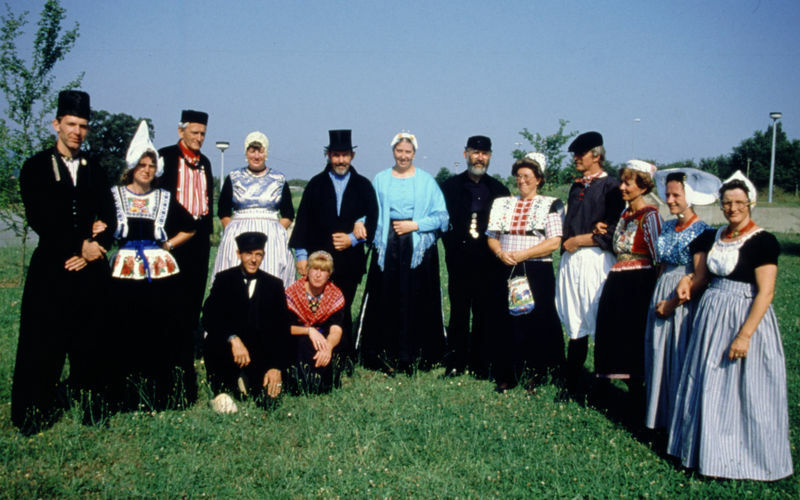 Dutch women are expected to wear skirts as part of the traditional dress, usually with at least two layers, and they can be bulky as there needs to be enough fabric to move while doing house work. The skirts are usually made of black, dark blue or other sombre colours. They are gathered at the waist or pleated, and always fall at least to the knee or longer. Men wear dark, loose-fitting trousers that are either knee-length or ankle-length. Men and women sport the traditional wooden clog (klompen). Traditionally hand-carved and painted, each region has their own style of decoration for their clogs. To make the clogs more comfortable, they are worn with thick woollen socks. Dutch women usually wear an apron over their skirt. They are either: short and flowered or floor-length and plain, made from white or subdued colour fabric. Depending on the region they may also include delicate lace work. Depending on the sort of head covering, they may have golden clips that hold the head covering in place. During the winter months they often wear a shawl around their shoulders going down to attach at the waist. Men often wear a neckerchief with a woggle. In Amsterdam, you can visit the Dutch Costume Museum, and gain insight into the history of Dutch traditional costumes in about an hour. Afterwards you can visit the Dutch Costume Photo Studio where you can try on the traditional clothing yourself and have a souvenir photo taken. Near to Zwolle is the Museum Staphorst featuring many of the traditional clothing of the region, and also demonstrations of how they add print to their fabric using blocks of wood with nails hammered in to the wood in a pattern. At Atelier 66 in Geithoorn you can dress up in traditional Dutch clothing for a family photoshoot. The Old Timers and Lace Museum in Leeuwarden focuses on the traditional methods used to create delicate lace that is often used in traditional clothing, especially that worn on special occasions.